The recent rains have provided ample opportunity for the opportunistic tumbleweed to propagate. If it rains enough, tumbleweeds will pop up wherever the ground is bare and has been dug up or disturbed – like my front yard. It was disturbed by trucks and tractors five years ago during construction. 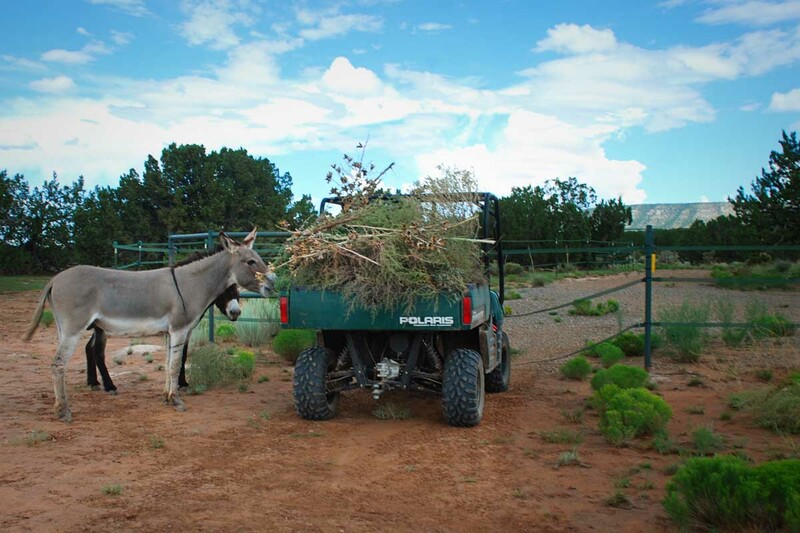 A smattering of weeds and grasses usually grows in this area, but the conditions this year have provided the perfect environment for growing tumbleweeds. 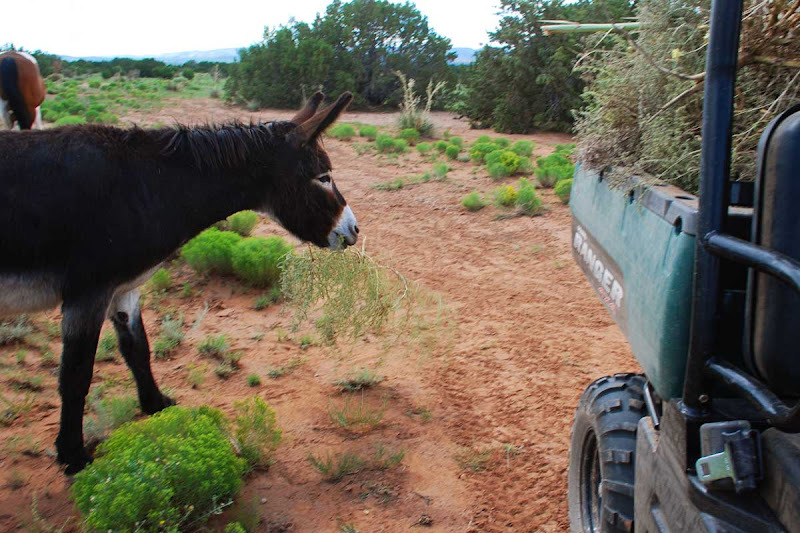 The burros and Hank love to eat tumbleweeds, for reasons I can't begin to imagine, so I'm relieved that a fence separates them from the tumbleweedy front yard. On Saturday, I decided it was time for the tumbleweeds to be gone. Have you ever pulled a tumbleweed? It's actually kind of fun, except for the sharp pointy stems. Some tumbleweeds are the size of Volkswagens, yet they're held in the ground by a wimpy set of roots. If the ground is damp, tumbleweeds are very easy to pull ... as long as you're wearing long sleeves, gloves and shoes. I suppose you could wait until they actually started tumbling, then you wouldn't have to pull them, but I don't have the patience for that and, besides, they're ugly. As I was hauling out my final load, George and Alan came over to investigate. I couldn't open the gate with them standing there, so I had to leave the load of tumbleweeds unattended while I went to get bribes to lure them away from the pile. And, yeah, I might as well grab the camera while I'm at it. By the time I got back, George and Alan had started to help me unload. Hank had better things to do. Alan prefers to play with his tumbleweeds before he eats them. ... he takes it over to George to share. George, how many times do I have to tell you? If you keep eating tumbleweeds your ear will fall off. Post processing: 1. PW's Warmer action at 50%; 2. MCP's High Definition Sharpening action at 75%; 3. PW's Bring on the Eyes action to bring out reflections in George's eyes; 4. PW's Quick Edge Burn action at 32%. 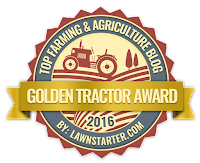 Interesting info on the tumbleweeds and all new to me since we don't have them here in east TN .. LOL! I got a kick out of the pictures of the boys helping but about lost my coffee, again, at the last picture and comment!!! LOL! That last one was hysterical! I grew up in El Paso and tumbleweeds were a frequent sight. But I don't think we ever pulled one. I guess I thought they always just tumbled! Don't you just hate it when your ear falls off? Such are the hazards of a tumbleweed! Is too much tumbleweed bad for burro bellies? I'd think your solution would be to let the guys at 'em, instead of pulling them all out yourself. The boys love tumbleweeds too. I pull them out along the driveway and from along the road and toss them over the fence into the pasture for them. It's like they can't get enough of them! Thank goodness they are so easy to pull. Good post - good little helpers too. Not surprised that Hank's too cool for all that. The last picture was hilairious! I actually thought you had photoshopped it when I saw the icon, but nope - that's just the way it was! Funny! Tumbleweeds!! Cows and pigs love them too, to play or eat. Last year while going to my daughter's house on the eastern plains, we passed a truck off the side of the road. The girls from the truck where playing with them, later we saw the same truck with a bunch of tumbleweeds tucked in the back. They were from Missouri. I figured tumbleweeds are a western thing. 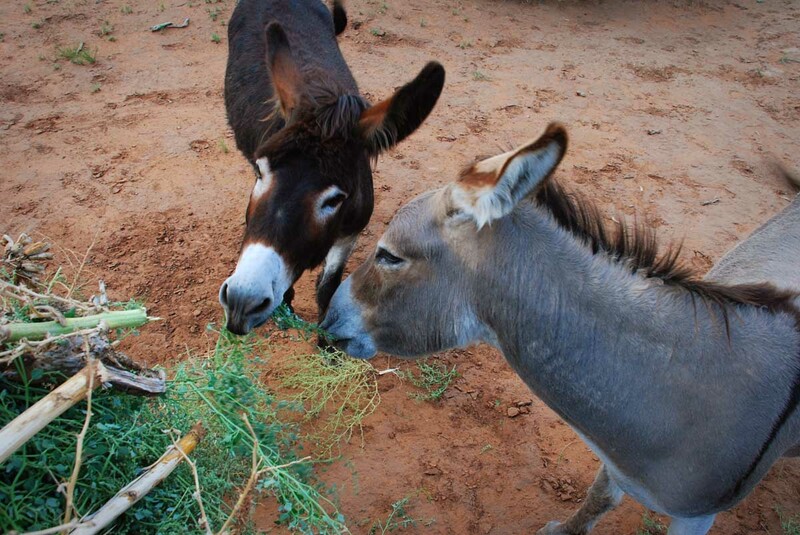 The burros probably thought you had set a buffet table for them; mnomnomnom thanks mom! 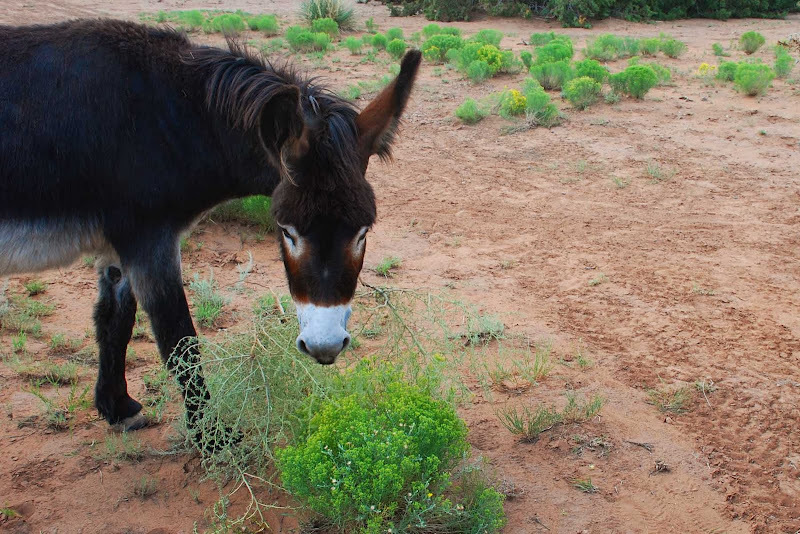 Have you seen the new donkey over at Gizzards and Calf Fries blog that Kit is doctoring? I'm sure the boys figured you'd set up a buffet for them. They must have been mighty disappointed when you drove off with their lunch! :) I let Russell eat some of them here-I'm too lazy to pull them all out. Got a good chuckle over that last photo and comment! One time I took my little mustang, Cali, down to the arena. There was a huge, dried tumbleweed there and SHE ATE IT! Aye! She actually enjoyed it! Go figure. Just wondering ... if the rain brings on the Tumbleweed, does it also bring back the Locoweed ? Geesh, sure hope not !! Another charming photo essay. Love the new "mouse" feature that lets me see the before and after version. Now if I could only get my photos to come out as good as your BEFORES, I'd be happy. Like Theresa, I'm going to have the Tumbling Tumbleweeds in my head all day! Loved the photos! My folks had lots of "old" records - and this was one of them. I think it was by the Sons of the Pioneers...??? Aww, Alan is a nice boy to share his food like that :). 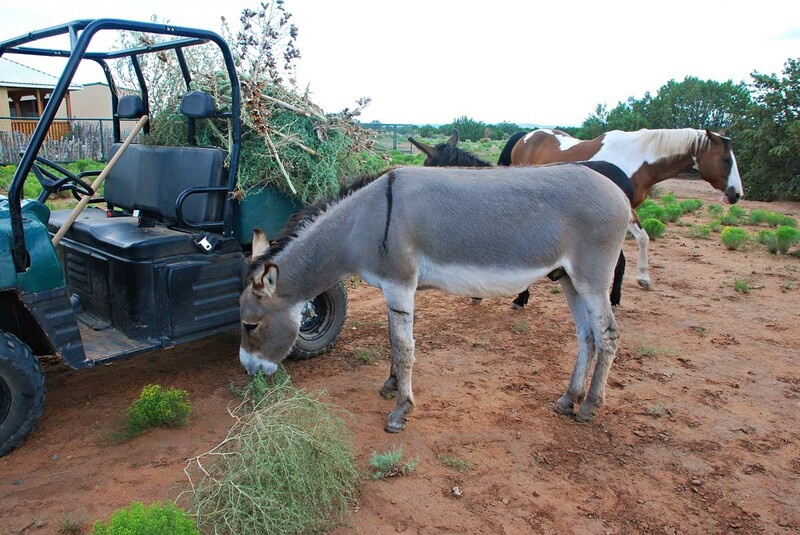 There must be some sweet tasting nutrient in those that are known only to burros. I love that they share. They look so happy nibbling on that stuff. I guess their affinity for tumbleweeds was one thing that enabled them to stay alive as wild boys. Lovely photo essay; missing ear syndrome, who knew? Love help like that. They have to get right in the middle of everything. My dogs help like that. Yep, just usually let tumbleweeds tumble.... Love the last shot and comment! Tumbleweed pulling....gloves, check. Long pants, check. Long sleeves? Uhhh, my arms will never look the same again. We pulled for almost two days last weekend, mostly tumbleweeds...some 4 o'clock, other assorted stuff I need to find in a field guide of some sort.